I am crying a little inside because I’m starting back to school posts in the middle of July, but I think I’m actually late! I’m also crying a little because I’m SO not ready for summer to end. Even though we still have about five weeks left, I know a lot of kids in other areas start back in the middle of August. When my son does go back, I want to be better prepared this year with school lunch & after-school snack ideas that he’ll actually want to eat. Whether you have two weeks, four or six left of summer, keep these great recipes and ideas handy for when your child starts back to school! School Lunch & Snack Ideas Your Kids Will Eat Up! My fellow bloggers are so clever. They come up with the smartest ideas for just about everything. I would fiercely envy their talents if they weren’t so generous about letting other bloggers share their amazing work in roundups like this. Be sure to visit the links for the full recipes & ideas! Let’s start with sandwiches! You can go the plain old bread and “something in the middle” route, or you can get creative and make it fun! One super easy way to do that is by cutting it into shapes! Check out these cute Flower Sandwiches for inspiration! Another great idea: make your own DIY Uncrustables! I love these because my son doesn’t like jelly. He eats peanut butter and fluff, which they don’t exactly sell in stores. So I just swap out the jelly for fluff! I could also try these Peanut Butter Roll Ups, since that’s what Tiffany uses to make them. 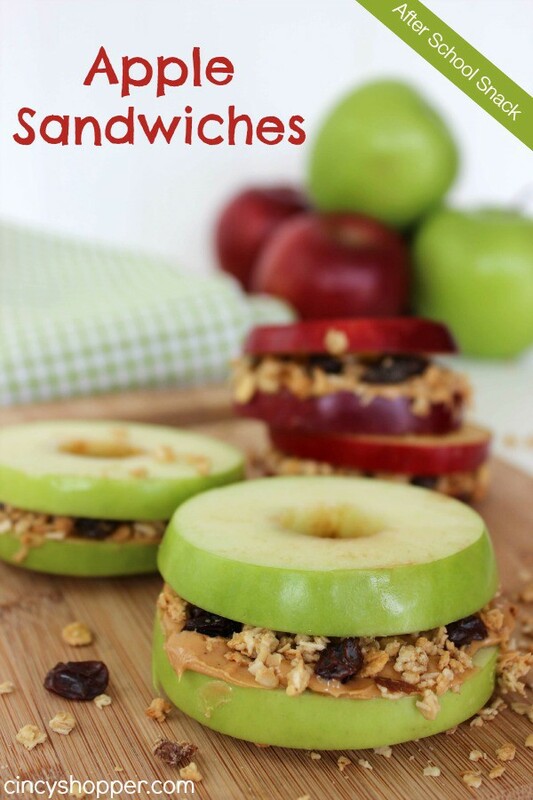 Of course, you could ditch the bread altogether and redefine “sandwich” with this super cute and tasty Apple Sandwich recipe! Don’t they look yummy? I have some apples on the counter, I may need to try these tonight for myself while I’m binging on Pretty Little Liars episodes! Another fun idea is to put everything on a stick with Shish Kebab Sandwiches! Perfect for when you forgot to run to the store and discover you only have one slice of bread left! For kids who like more variety, Bento boxes are ideal. My son eats “finger food platters” all summer long for his meals. Usually they consist of turkey pepperoni, some type of cheese, crackers, carrots, and black olives. None of that would hold up well if I threw it in a brown paper bag, but in a Bento box he can have all his favorites as he heads back to school. 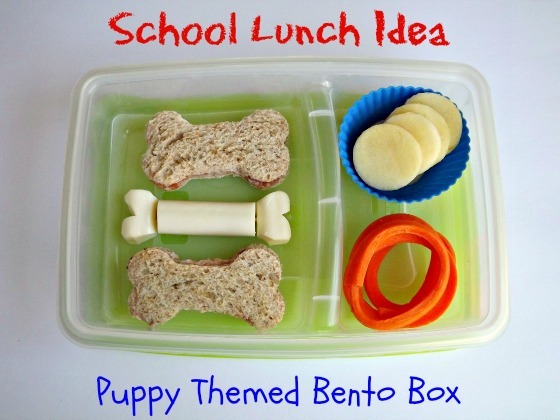 I really love this adorable Puppy Themed Bento Box idea! You can fill the sandwich with just about anything, although Felissa’s strawberry jam and cream cheese sounds so yummy! My son would absolutely LOVE this Pizza Bento Box, especially since he’s such a huge fan of pizza Lunchables. 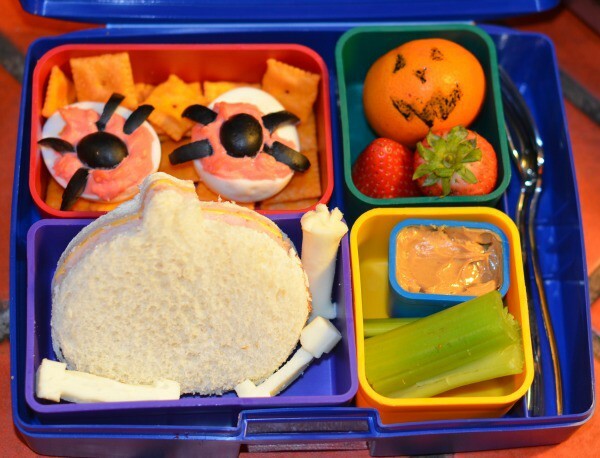 Throughout October, this Halloween Bento Box will thrill kids! Younger kids will adore this Caterpillar Bento, while older kids will get a kick out of this Spongebob Box! Whip up these after-school snacks for kids while they’re at school or make them ahead of time together on a Sunday and stop your kids from reaching for the cookies! 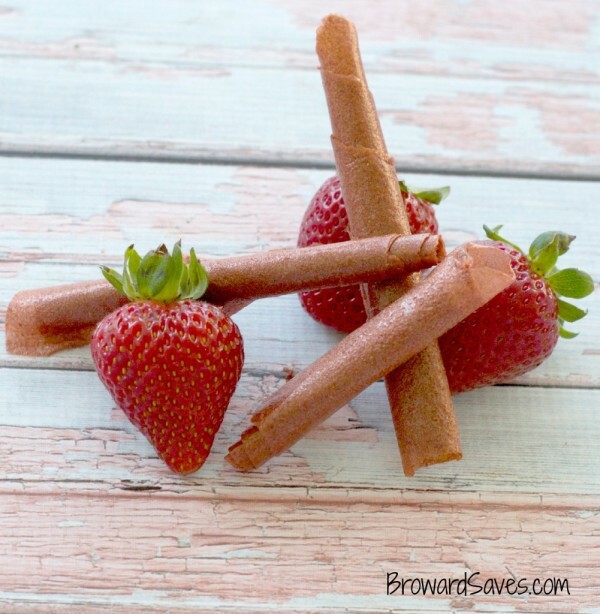 These Homemade Strawberry Fruit Rollups are perfect for both after-school and in the lunch box! They actually look really easy to make too! Like surprisingly easy! Plus, they only have ONE ingredient: strawberries! I wonder if you could use other fruits? Speaking of strawberries, I really want to try out these Strawberry Peanut Butter Quesadillas! They sound so unique and delicious! Another super unique idea: Edible Pencils! You have to check them out! 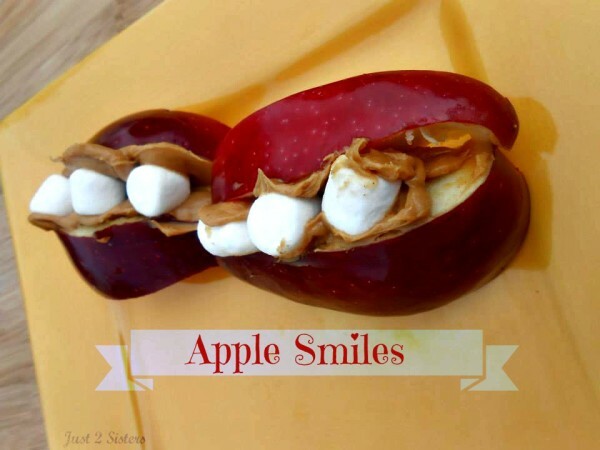 Kids will crack up when you serve them these funny Apple Smiles for their after-school snack! Looking for a fun spin on the classic rice puff treats? Try these Peanut Butter Rice Puff Squares! 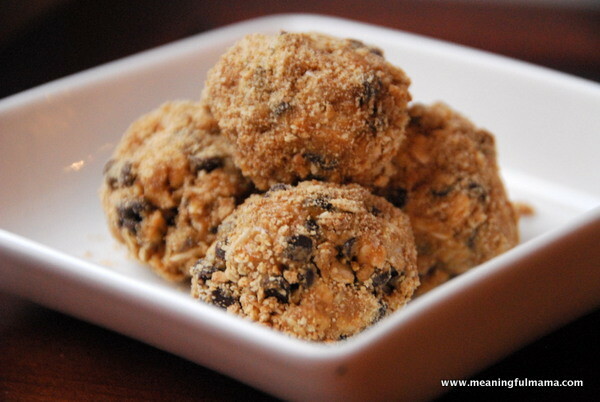 I am fascinated with the name of this after-school snack: Moon Balls. They look like yummy little energy balls, don’t they? If your kids like cherries as much as Jake does, try out these Peanut Butter & Cherry Energy Bites! These back to school lunches and snack ideas should definitely get you started! 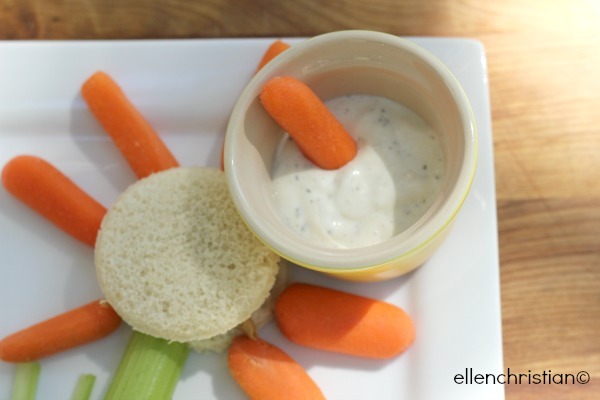 Do you have any go-to lunches or after-school snack recipes that your kids absolutely love? Tell me about it in the comments! I love all of these ideas. My kids love apple sandwiches! They are tasty and healthy! I love all of this. Such great, and healthy ideas. I bet my kiddos would love all of these! 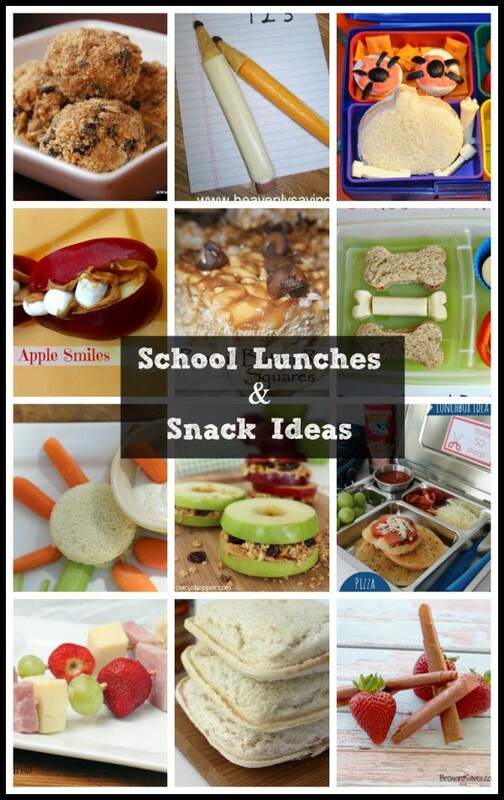 Wow these are really cute lunch ideas for kids. I’m not very creative when it comes to making lunches… maybe if I had a few good cookie cutters? Who has time! These are great ideas. I would love to taste that apple sandwich. What kid wouldn’t love those? I have seen those string cheese pencils for a few years now on Pinterest, and I just love them! When you said actually want to eat, that made me smile. Therein lies the challenge here. I’m actually preparing a list for my boys. Creative and healthy, I love these ideas! I love all of these ideas. I think its important to give kids a lunch they will eat. If they throw it away they will be hungry until they get home. Hunger and learning do not go hand in hand. I think kids really go crazy over food that is both appetizing and fun-looking to eat, like the Puppy Theme and Apple Sandwiches shown here.